Singapore's IP Hub Master Plan - what does it mean for trademark practitioners? 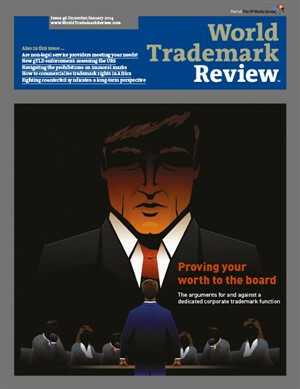 Has the ECJ's expanded list of functions widened the scope of trademark protection? In Société des Produits Nestlé SA v Cadbury UK Limited, the Court of Appeal of England and Wales has overturned a decision of the trial judge allowing the registration of Cadbury’s trademark for the colour purple in respect of its milk chocolate confectionery. In Martin y Paz Diffusion SA v Depuydt (Case C-661/11), in a reference for a preliminary ruling from the Belgian Court of Cassation, the European Court of Justice (ECJ) has clarified the nature of ‘consent’ to use a registered trademark under Article 5(1) of the EU First Trademarks Directive (89/104/EEC). The European Commission has published a study on the economic impact of IP across the European Union. Applicants for generic strings have clarified their intended use of the top-level domains (TLDs) that they seek to operate. This came a day after the Internet Corporation for Assigned Names and Numbers (ICANN) revealed that some stalled applications can proceed to delegation if the applicant blocks certain secondlevel domains while further assessment is carried out. In other gTLD-related news, Google has launched its online domain registry, Charleston Road Registry. In Rintisch v Office for Harmonisation in the Internal Market (OHIM) (Cases C-120/12 P, C-121/12 P and C-122/12 P), the European Court of Justice has held that the Board of Appeal of the Office for Harmonisation in the Internal Market (OHIM) had correctly dismissed oppositions filed by Bernhard Rintisch, even though the board had erred in assuming that it had no discretion to take into account additional evidence filed after the expiry of the deadline set by OHIM. Following years of deliberation, the Standing Committee of China’s National People’s Congress has finally approved the amendments to the Trademark Law. The amendments will come into force on May 1 2014.